In December 2006, the shareholders acquired the shares of Al Rusail from the Government. The plant is located inland, approximately 40 km west of Muscat in an industrial area. It consists of eight Frame 9E gas turbines installed in four phases between 1984 and 2000. Al Rusail's primary fuel is natural gas supplied by MOG, but diesel oil is also stored on site to serve as a backup fuel. Power capacity and production are sold to the OPWP under the 17-year PPA ending in March 2022. The combustion turbines are laid out side by side. An overhead travelling crane can access all turbines for maintenance purposes. The generating equipment is outdoor type with the 132 kV Gas Insulated Switchgear (GIS) housed in brick buildings. Underground cable circuits run from the generator step-up transformers to the 132 kV switchgear and then by overhead line to the system at the northern and southern site boundaries. The control room, management offices and administration are housed in one building adjacent to the gatehouse. Spares are housed in a separate building on the site. 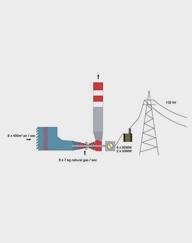 The Plant is connected to the main interconnected transmission system at 132 kV. Al Rusail has contracted all O&M activities at the power plant to STOMO. Phase I consists of GTs 1, 2 and 3 the first being commissioned in 1984. Phase II consists of GTs 4, 5 and 6 the first being commissioned in 1987. Phase III consists of GT 7 commissioned in 1997. Phase IV consists of GT 8 commissioned in 2000. As a result of technology advances over time, the machines have different firing temperatures and spares are therefore not necessarily interchangeable between units. Generators for GTs 1 to 6 are of Brush (UK) manufacture, for GT 7, Alstom (France) and GT 8, BHEL (India). GTs 1 to 3 transformers are Bonar Long (UK) manufacture, GTs 4 to 6 Nuova di Legano (Italy), GT 7 i Crompton Greaves (UK) and GT 8 BHEL (India). Following the failure of GT2 transformer in July 2012, it was replaced with a new ABB make transformer. The 132 kV SF6 switchgear comprises two (2) phases, phase 1 being of GEC (UK) manufacture (12 bays), whilst phase 2 is of Merlin Gerin (France) manufacture, DHT7 (13 bays). Copyright © 2019 SMN power. All rights reserved.